A big LED board which has a full-color spectrum. 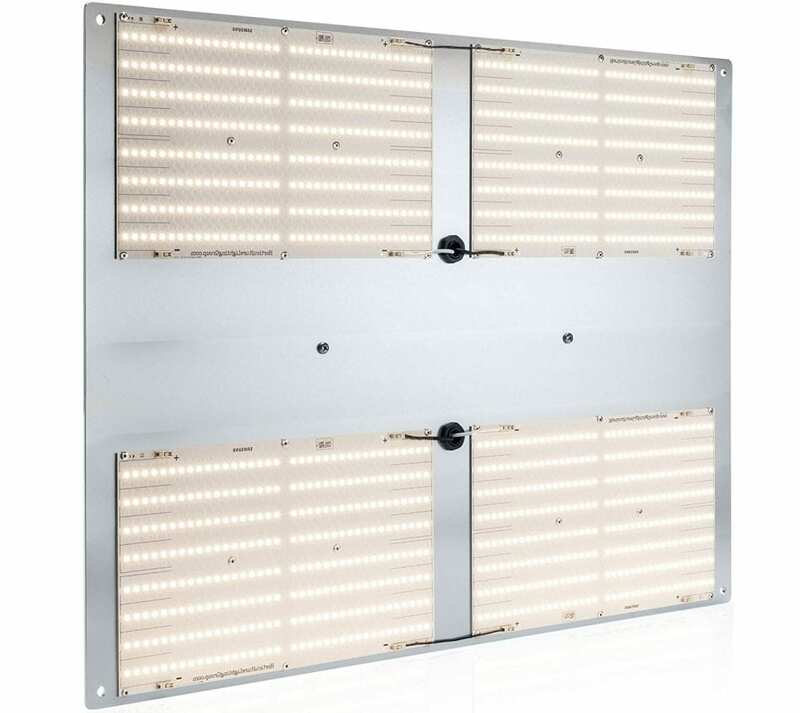 The HLG Quantum Board 550 V2 LED grow light enhances photosynthesis with the usage of more green and yellow light. Also, this LED grow light with white light technology is designed for the rapid growth of plants at different stages. Furthermore, Horticulture Lighting Group carries amazing and unique features. So, read on and let’s see what this HLG quantum board has to offer. For who is the HLG 550 V2 Quantum Board? The HLG 550 V2 LED grow light is your next go-to light for the growing cannabis at all stages. Having 4 custom designed quantum boards by Samsung Company, this LED grow light is surely one that you can rely on. 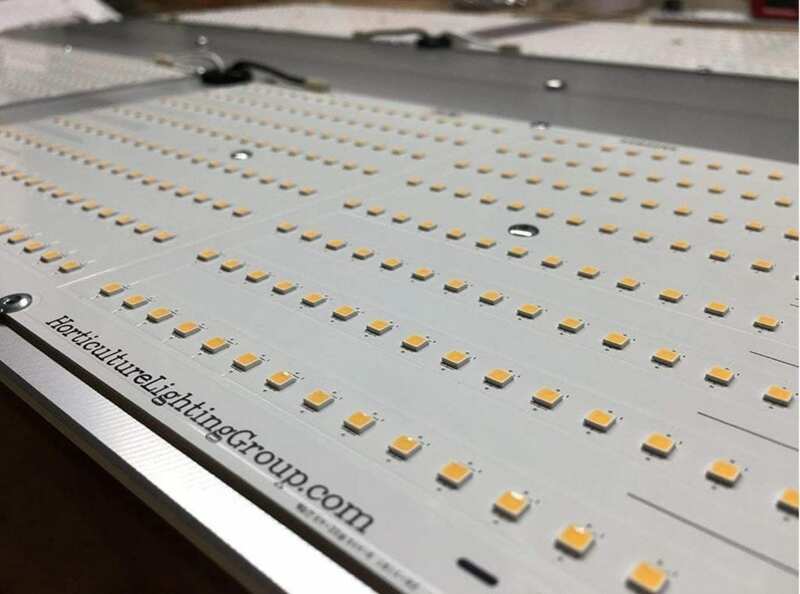 HLG 550 V2 has custom designed quantum boards. Having LEDs from Samsung, they use white light technology to focus on the plants. Furthermore, it is assembled in the USA. In addition, this HLG quantum board enhances the photosynthesis process required for the germination and flowering stages. All in all, they give great canopy light penetration. The biggest pro of this quantum board is the diffusion of the light. You can cover an area of 4.5 x 4.5 feet for flowering and 6 x 6 feet for the vegetative phase. This is a huge area. It fits perfectly with a 4×4 grow tent or other grow room where you need a diffused light. The HLG 550 V2 LED grow light comes with a full spectrum light. This spectrum is at 3000k for this HLG quantum board. This full-color spectrum especially focuses on the yellow and green light (invisible to the eye). As a result, this makes it responsible for the healthy growth of veg and flowers. It comes with a 480w power draw that replaces a 1000w Single Ended HID. You can dim the light with the included dimmer to a minimum of 240w. 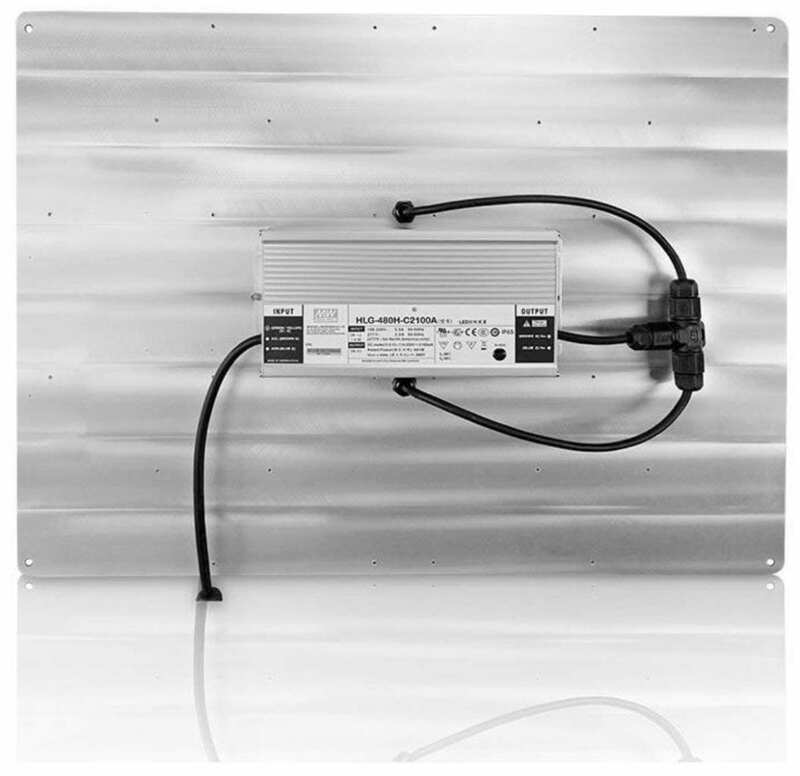 This HLG quantum board offers a perfectly diffused full spectrum light for a large area. It is probably one of the best lights on the market when it comes to light spectrum and coverage. Therefore, I must say that this is an amazing light. My plants love it! This HLG quantum board is great in keeping itself cool. This quantum board is quite large and therefore it is easier for the light to keep itself cool. This LED grow light is one of the coolest lights on the market. The HLG 550 V2 is great in heat dissipation and working cool. This LED grow light does not have any fans, as it doesn’t need any. Its design is so high quality that it is perfect at keeping low temperatures. HLG 550 v2 quantum board has proven itself to be one of the best when it comes to flower and vegetative footprints. It has a flower footprint of 4’ x 4’ to 4.5’ x 4.5’ as well as a veg footprint of 6’ x 6’. So, the HLG quantum board does a perfect job in lighting all your plants and canopies. And, it provides a good diffused light. This light is not super bright in the middle and weak at the outsides. It evenly spreads its strength over the area. The quantum board does a great job in spreading the light. Together with the coverage area, low temperature and perfect full spectrum, this light seems perfect for every grower. The dimmable watt feature lowers down the value of the watt, what is ideal for different plants and growth stages. 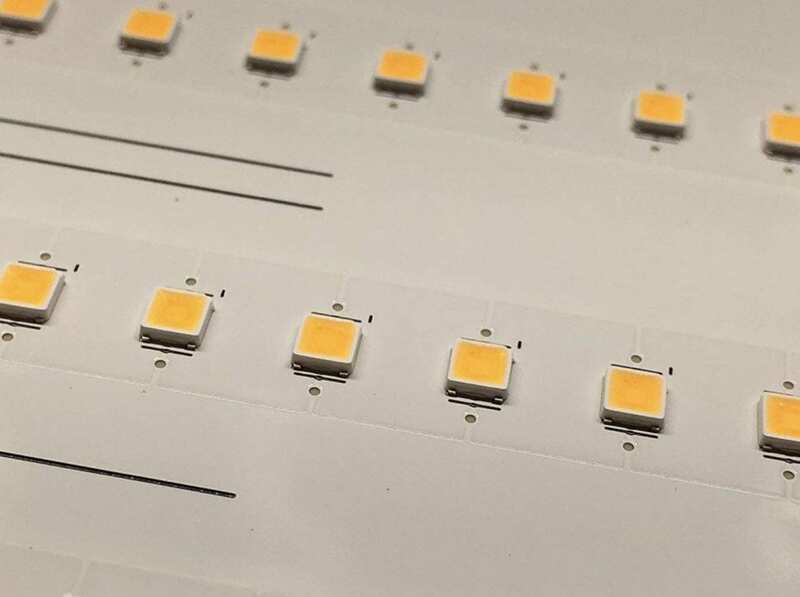 This LED grows light has a 3 years warranty. Therefore, it guarantees the quality of the light. Based on HLG 550 V2 review, this is for the indoor growers who are looking for the perfect yield. It is an ideal choice for those who want to switch from HPS or MH bulbs to LED. This light is equal to a 1000w HPS. The HLG quantum board is a highly effective choice for those who want quality and safety. The dimmable feature lets you choose the right wattage. Also, for those looking for a white light technology, this is the best option. Keep in mind that this LED grow light is not cheap. Therefore, it is only for the professionals. Still not sure what to think of the HLG 550 V2? Me and many others are very enthusiastic about this light. Check out this video review to be convinced about the capabilities of this light! All in all, this HLG 550 V2 LED grow light will blow you out with its efficiency and high quality. It has a power saving feature along great full spectrum light. Also, the light is super lightweight, of very high quality and provides white light. The diffusion of the light is impeccable. 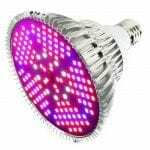 Therefore, it provides great coverage that no other LED grow light can produce as well. The included dimmer tops it all of and makes it a great investment in the long run for every professional indoor grower. 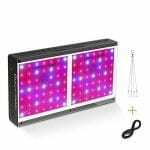 Are you interested in other LED grow lights? Maybe our most read review is something for you! The MarsHydro 300w is a great light. 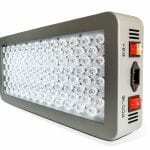 Also, we have reviewed a lot of COB LED grow lights! Are you looking for more than just a LED grow light? We have written numerous great reviews on different tools. Check out our reviews on the best 4×8 grow tents, bud trimmers or learn how to grow hydroponically.